Raphael (/ˈræfiəl/; Hebrew: רָפָאֵל, translit. Rāfāʾēl, lit. 'It is God who heals', 'God Heals', 'God, Please Heal'; Ancient Greek: Ραφαήλ, Coptic: ⲣⲁⲫⲁⲏⲗ, Arabic: رفائيل‎ or إسرافيل) is an archangel responsible for healing in the traditions of most Abrahamic religions. Not all branches of these religions consider the identification of Raphael to be canonical. In Christianity, Raphael is generally associated with an unnamed angel mentioned in the Gospel of John, who stirs the water at the healing pool of Bethesda. Raphael is also an angel in Mormonism, as he is briefly mentioned in the Doctrine and Covenants. Raphael is also mentioned in the Book of Tobit, which is accepted as canonical by Catholics, Orthodox, and some Anglicans. Raphael is a venerated angel within the Roman Catholic, Eastern Orthodox, Anglican, and Lutheran traditions, and he is often given the title "Saint Raphael". In Islam, Raphael is the fourth major angel; and in the Muslim tradition, he is known as Isrāfīl. Though unnamed in the Quran, hadith identifies Israfil with the angel of Quran 6:73. Within Islamic eschatology, Israfil is traditionally attributed to a trumpet, which is poised at his lips, and when God so commands he shall be ready to announce the Day of Resurrection. The angels mentioned in the Torah, the older books of the Hebrew Bible, are without names. Shimon ben Lakish of Tiberias (AD 230–270), asserted that all the specific names for the angels were brought back by the Jews from Babylon, and modern commentators would tend to agree. Raphael is named in several Jewish apocryphal books. The Life of Adam and Eve lists the archangels as well: Michael, Gabriel, Uriel, Raphael and Joel. Medieval Jewish philosopher Maimonides made a Jewish angelic hierarchy, which includes the archangel Raphael. Medieval French rabbi, author and Tanakh (Hebrew Bible) commentator Rashi views Raphael as being one of the three angels that appeared to Abraham in the oak grove of Mamre in the Book of Genesis. Raphael is also mentioned in the Book of Enoch alongside archangels Michael, Gabriel and Uriel. Of archangels in the angelology of post-Exilic Judaism, only Michael, mentioned as archangel (Daniel 12:1), and Gabriel are mentioned by name in canonical books. The identification of Raphael is not accepted as canonical by most denominations of Protestantism, as the name only appears in the deuterocanonical Book of Tobit. Nevertheless, the name "Raphael" is widely recognized in church tradition as a result of Protestantism's origins in Catholicism. Raphael (and other traditional angels) are not venerated in Protestantism. The Book of Tobit is considered deuterocanonical by Catholics, Orthodox, and some Anglicans. In it, Raphael first appears disguised as the human travelling companion of Tobit's son, Tobiah (Greek: Τωβίας/Tobias), calling himself "Azarias the son of the great Ananias". During the course of the journey, the archangel's protective influence is shown in many ways including the binding of a demon in the desert of upper Egypt. After returning and healing the blind Tobit, Azarias makes himself known as "the angel Raphael, one of the seven, who stand before the Lord" Tobit 12:15. He is venerated as Saint Raphael the Archangel. In the New Testament, only the archangels Gabriel and Michael are mentioned by name (Luke 1:9–26; Jude 1:9). 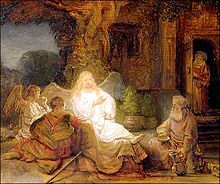 Later manuscripts of John 5:1–4 refer to the pool of Bethesda, where the multitude of the infirm lay awaiting the moving of the water, for "an angel of the Lord descended at certain times into the pond; and the water was moved. And he that went down first into the pond after the motion of the water was made whole of whatsoever infirmity he lay under". Because of the healing role assigned to Raphael, this particular angel is generally associated with the archangel. Due to his actions in the Book of Tobit and the Gospel of John, Saint Raphael is accounted patron of travelers, the blind, happy meetings, nurses, physicians, medical workers, matchmakers, Christian marriage, and Catholic studies. As a particular enemy of the devil, he was revered in Catholic Europe as a special protector of sailors: on a corner of Venice's famous Doge's Palace, there is a relief depicting Raphael holding a scroll on which is written: "Efficia fretum quietum" (Keep the Gulf quiet). On July 8, 1497, when Vasco Da Gama set forth from Lisbon with his four ship fleet to sail to India, the flagship was named—at the King of Portugal's insistence—the St. Raphael. When the flotilla reached the Cape of Good Hope on October 22, the sailors disembarked and erected a column in the archangel's honor. The little statue of St. Raphael that accompanied Da Gama on the voyage is now in the Naval Museum in Lisbon. The Coptic Orthodox Church celebrates his feast on Kouji Nabot 3 and Koiak 13. The Archangel Raphael is said to have appeared in Cordova, Spain, during the 16th century; in response to the city's appeal, Pope Innocent X allowed the local celebration of a feast in the Archangel's honor on May 7, the date of the principal apparition. Saint John of God, founder of the Hospital order that bears his name, is also said to have received visitations from Saint Raphael, who encouraged and instructed him. In tribute to this, many of the Brothers Hospitallers of St. John of God's facilities are called “Raphael Centers” to this day. The 18th century Neapolitan nun, Saint Maria Francesca of the Five Wounds is also said to have seen apparitions of Raphael. Raphael (Arabic: إسرافيل‎, translit. Isrāfīl, alternate spellings: Israfel, Esrafil) is a venerated archangel according to Islamic tradition. In Islamic eschatology, Israfil will blow the trumpet from a holy rock in Jerusalem to announce the Day of Resurrection. The trumpet is constantly poised at his lips, ready to be blown when God so orders. "And the trumpet shall be blown, so all those that are in the heavens and all those that are in the earth shall swoon, except him whom Allah will; then it shall be blown again, then they shall stand up awaiting." — Qur'an (39.68). Certain Islamic sources indicate that, created at the beginning of time, Israfil possesses four wings, and is so tall as to be able to reach from the earth to the pillars of heaven. A beautiful angel who is a master of music, Israfil sings praises to God in a thousand different languages, the breath of which is used to inject life into hosts of angels who add to the songs themselves. Further he is probably the highest angel, since he also mediates between God and the other archangels, reading on the Tablet to transmit the commands of God. According to Sufi traditions reported by Imam al-Suyuti, the Ghawth or Qutb ('perfect human being'), is someone who has a heart that resembles that of the archangel Israfil, signifying the loftiness of this angel. The next in rank are the saints who are known as the Umdah or Awtad, amongst whom the highest ones have their hearts resembling that of archangel Mikhail (archangel Michael), and the rest of the lower ranking saints having the heart of Jibrail (archangel Gabriel), and that of the previous prophets before the Islamic prophet Muhammad. The earth is believed to always have one of the Qutb. St. John of God Catholic Church in Chicago, IL, was disassembled, moved and reassembled as St. Raphael the Archangel Church in Mill Creek, IL. He also appears as "Rafael" in the role-playing game Anima Beyond Fantasy as one of the seven Beryls (god-like spirits of light, all but one having taken female gender). She is identified by the humans with the archangel of the same name and incarnates life and nature. Characters associated with Angelic figures, at least by borrowing the names, also feature in the video game industry, as an example there is the title: El Shaddai: Ascension of the Metatron. The character Raphael Santiago from Cassandra Clare's The Mortal Instruments, and the TV series Shadowhunters is named in reference to Raphael. In season 2 of the TV series Criminal Minds the archangel Raphael is brought up as being one of Tobias Hankel's personalities. Charles, Robert Henry (1917). The Book of Enoch – via Wikisource. Lovasik, S. V. D., Lawrence, G. Walking With St. Raphael.